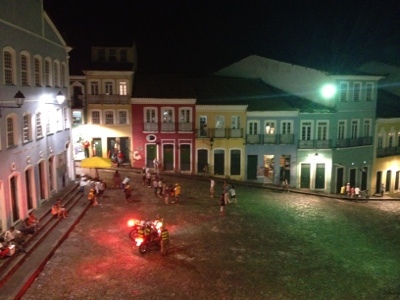 As I sit and write this, it’s mid evening in Centro Historico in Salvador De Bahia. The square, more of a triangle, which I overlook is teaming with activity, couples out for a few drinks and some acaraje sold from the countless street vendors in their traditional Bahian dress. Parties of people looking for a good time in one of the many street bars and the general sightseers, all mix with the locals for a vibrant atmosphere! This is all set to the soundtrack of pumping drums, banged on mass and to the rhythm of some mixture of African and European, occasionally punctuated by a lone trumpet. All this feeds in to the feeling I can’t shake that this could quite easily be the set of a Bond film or a John Le Carre novel, and I, the protagonist. I watch an outrageously beautiful couple walk down arm in arm, past a street vendor whom they briefly talk with. There it was, the dead drop, a manila envelope passed between the two. A motorbike zooms passed, the rider’s face disguised by his helmet – counter surveillance? The drumming seems to grow louder and faster, building to a crescendo. The sniper in the top floor window waiting for the perfect moment to strike, the drum beats drowning out the shot. But he’s too late and an anonymous third party intercepts the couple, their state secrets gone forever, doubtlessly to Cuba and then on to Moscow! A mosquito bite in my ankle wakes me from my day dream and, after a futile slap of my leg, I return to gazing out over the ‘square’. For me this was the exotic adventure I had been waiting for, the side of Brazil I had, to date failed to see. Above all, even with the shabby 18th Century buildings and flaking paint, it was somehow impossibly glamourous!